I’ve always found it odd that taste – in particular, taste in relation to food – can change so much over time. I wasn’t a fan of tomato soup as a kid. I would eat it, but I’d much rather have a different kind. Something creamier, like Cream of Broccoli or Cream of Mushroom. Or, better yet, French Onion, which was always my favourite. Now, though, I find myself craving tomato soup once in a while. But never on its own, always with either cheese or – more often – a grilled cheese sandwich. And I figured, hey, if I’m craving it, why not just make my own so that I can freeze it and not have to worry about having cans of it on hand? I’m sure you’ve figured out by now where this is heading. I wanted a recipe for tomato soup, so I found one. Then I played with it so that it was something I truly enjoyed and could easily make with things I tend to have in my cupboard. The recipe I started with was The Kitchn’s Cream of Tomato Soup. It looked fairly simple to me, and it called for ingredients that I like. Really, the only problems were that I tend not to have celery in my fridge and there were a couple of other flavours I wanted to incorporate. So, I played. I used celery salt instead of the celery and added dried garlic. I also switched the 15-ounce can of diced tomatoes in puree for a 28-ounce can of diced tomatoes without the puree. The lack of puree meant a slightly thinner soup, but I was still able to get some nice tomato chunks by not fully blending everything. Besides, I don’t like when my tomato soups are too thick, so the lack of puree really worked for me. Then, of course, I added cheddar cheese. The soup I ended up with was wonderful. The whole thing was easy to make, and it was ready within about 30 to 45 minutes, making it a great weeknight meal. Plus, it froze really well, so any soup that was left over won’t go to waste. And the flavour? Well, I loved the flavour. The tomato wasn’t too strong, but it was still very much a tomato soup. The spices, too, were well balanced, and I found I didn’t need to add much salt and pepper before eating. Oh, and I don’t want you thinking the cheese is just a garnish. It actually adds a wonderful bit of flavour to the soup. But I do recommend not adding it until the soup is being served, as you don’t want it to completely disappear within the soup. At medium heat, melt the butter in a large soup pot. Add the onion and cook until the onion starts to turn translucent. Add the garlic and cook for about a minute, then add the remainder of the spices. Let cook for another a minute. Add the tomatoes, baking soda and chicken stock. Reduce heat to low and simmer for about 10 minutes. Remove the pot from heat and puree, using a hand blender or regular blender, until you’ve reached the consistency you like. Return the pot to the heat and stir in the milk. Make sure to stir well so that the milk blends into the soup. Heat the soup to your desired temperature. Remove from heat and add salt and pepper to taste. 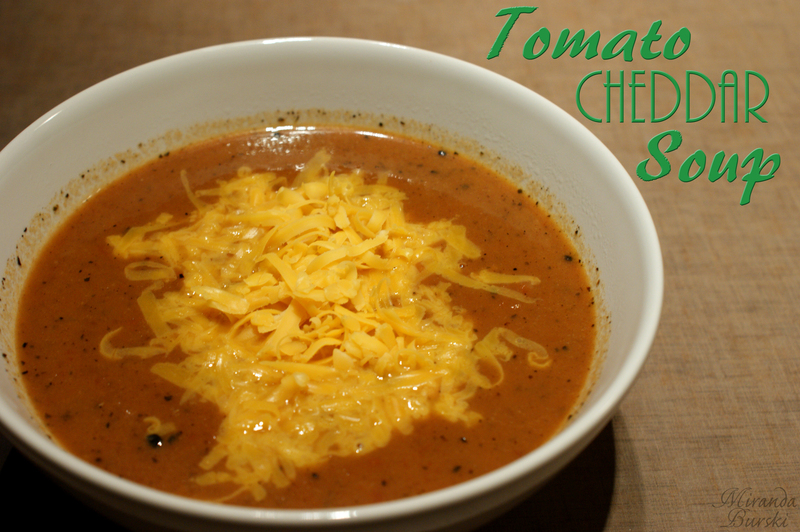 Dish out the soup and dropped the desired amount of cheddar cheese on top of each bowl. Serve.